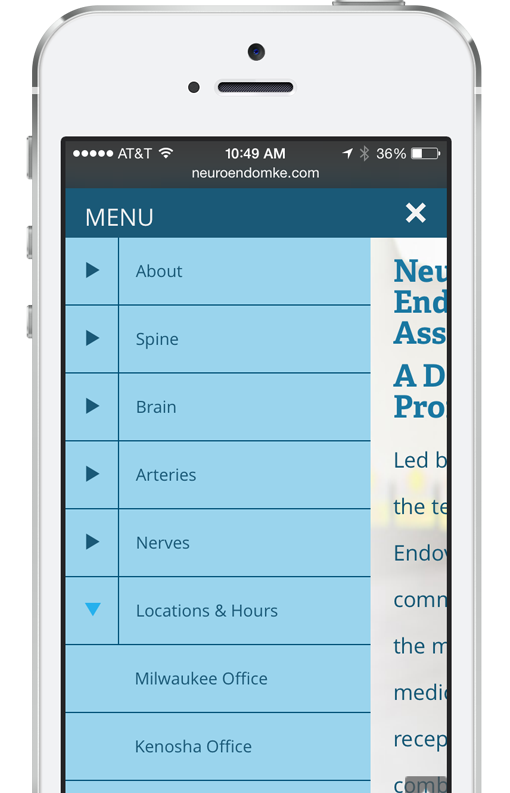 Envy was asked by the team at Neurosurgery and Endovascular Associates to help them completely redesign their web experience from the ground up. The new site would serve as the flagship of NEA’s new digital strategy developed by our good friends at Rocket Clicks. With the razor-sharp team at Rocket Clicks on-board, we were eager to tackle this challenge. NEA’s new site features a robust navigation structure, allowing visitors to browse tons of information. We wanted to create a mobile menu that didn’t sacrifice any of the information, but also remained usable at small sizes. We crafted an off-canvas menu with nested menu items that allows users to collapse and expand their way to the information they need. With a responsive approach we were able to craft a site that scales appropriately to user’s device, from phone to desktop, without any compromises in content. With all the super-high-resolution devices out there it is important to server the appropriate images to these devices. NEA’s new site is retina-ready, serving hi-res images to the devices that need them. One of the key requirements laid out by Dr. Ahuja and his team was to craft a site that didn’t feel cold and impersonal. Dr. Ahuja cares for his patients on a personal level and wanted the site to reflect that, so we set out to create a visual language that reflected his friendly and approachable personality. Our design and development coupled with Rocket Click’s bullet-proof digital strategy lead to web property that Dr. Ahuja and his team could be proud of. 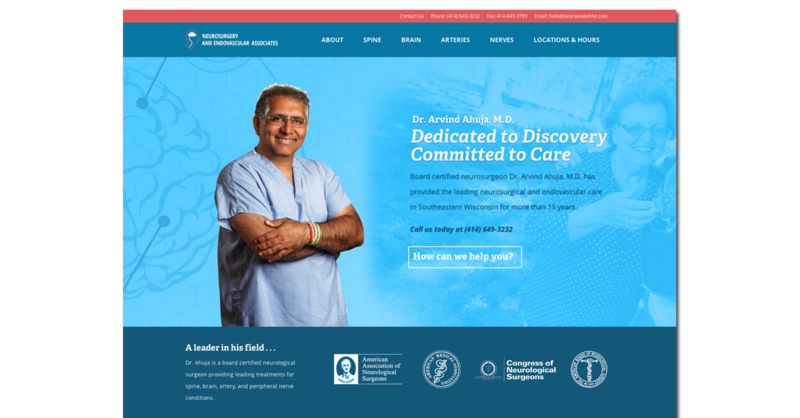 We’ve replaced the dusty, old site with a new and improved experience that reflects the professional and patient-focused practice of Dr. Ahuja and the Neurosurgery and Endovascular Associates team. Launching a new site? We want to be part of your team. If you are looking for a dedicated team of designers and web experts to help you kick off your new project, reach out to Envy Creative today. We jump at the opportunity to get in on the ground floor of our clients’ success.